Supreme Court Hobby Lobby decision: Alito’s argument is stronger than Ginsburg’s. Alito’s Hobby Lobby argument is stronger than Ginsburg’s. 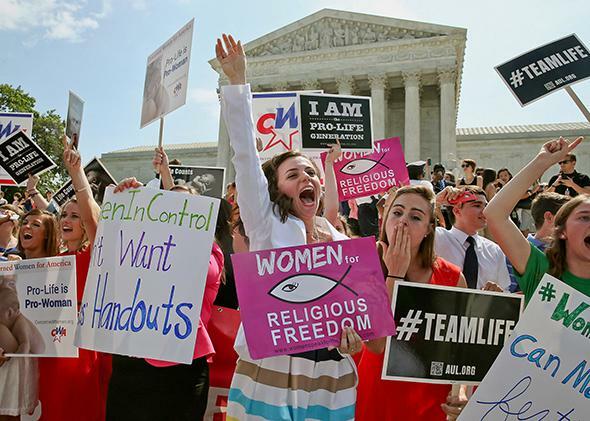 Hobby Lobby supporters react to the Supreme Court decision on June 30, 2014, in Washington. The Religious Freedom Restoration Act says that the federal government may not put substantial burdens on religious exercise. The Affordable Care Act, as implemented by some federal regulations, required Hobby Lobby to include contraception in its employee health insurance plan. Hobby Lobby covered most forms of contraception, but not four that it believed amounted to abortion, which violates the religious beliefs of Hobby Lobby’s owners. If Hobby Lobby doesn’t comply with the regulations, it must pay taxes and penalties. So the question before the court boils down to whether those taxes and penalties substantially burden Hobby Lobby. The majority, in an opinion written by Justice Samuel Alito, said yes. The dissenters said no. First, is a for-profit corporation like Hobby Lobby a “person” within the meaning of RFRA, which extends its protections to “persons” and doesn’t mention for-profit corporations? Alito says yes. Corporations are presumptively treated as persons under the law, and even the feds agree that RFRA protects noncommercial corporations like churches. Justice Ruth Bader Ginsburg, writing in dissent, says that corporations don’t “exercise” religion. Alito makes the better argument. Once Ginsburg says that “the exercise of religion is characteristic of natural persons, not artificial legal entities,” she gives away the game. A church is an artificial legal entity. Interpreting “person” to encompass corporations but not for-profit corporations doesn’t pass muster. And note that some nonprofit corporations do make money, just like for-profit corporations, and can be commercial in nature (thus, there are both for-profit and nonprofit hospitals that do essentially the same thing—provide care in return for money). The essential difference is a tiny one: The stakeholders in a nonprofit must take their compensation in a form that does not vary with the firm’s profits. It’s hard to imagine that Congress wanted the coverage of RFRA to turn on this distinction. I’ve glossed over many other issues, but Slate wants me to get the conversation going, so I’ll leave it at that. My initial reaction is that Alito’s legal argument is stronger, but that the law—as now interpreted—is pretty dumb. Congress is almost always accommodating to religious interests—that’s why RFRA was enacted in the first place—so it hardly needs to tell the courts to review all its laws and regulations to ensure that religious interests are taken into account. When it issues regulations, the federal government also is sensitive to religion. This case may well have radical implications, but it is too soon to tell. There are various ways in which the language of the majority can be interpreted narrowly. It’s hard to imagine that a large corporation with thousands of shareholders could take advantage of this ruling. I suspect the majority was influenced by the fact that the government in this case had no trouble making accommodations for nonprofit corporations. But the case will contribute to the Culture Wars. Early in her dissent, Ginsburg, quoting an earlier case, says, “The ability of women to participate equally in the economic and social life of the Nation has been facilitated by their ability to control their reproductive lives.” So she sets up Hobby Lobby as a clash between women’s rights and religious rights. It’s not an entirely fair characterization of this case, since regulators tried to balance these rights by granting an exemption to nonprofits, and in that light the court’s holding—extending the exemption to religious for-profits—seems incremental rather than radical. * But if the lower courts take the strict scrutiny test at face value, then Hobby Lobby will indeed be a victory for conservative interests. Correction, July 1, 2014: This post originally stated that Congress granted a religious exemption to the contraception mandate in the Affordable Care Act to nonprofit organizations. It was federal regulators that did so.